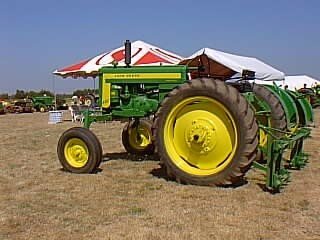 This picture shows a 1958 version of the John Deere 420H. The tractor was produced from 1956 to 1958. The "20 Series" came out in six basic models, the 320, 420, 520, 620, 720 and 820. The 420H is the high-crop version of the 420. I Have A 430-W.New Tires 3PT Hitch,PTO,Tractor Runs Good. 4.000 FIRM.Dorchester S.C....ONE HOUR FROM CHARLESTON OR COLUMBIA S.C.. 803-347-2518 THANKS. i have a 420-u series with a front end loader needs tires needs restored asking 2000.00 mayflower ar. I own a 420W, has no yellow paint on hood or radiator panels. It has john deere,written in chrome letters on the front of radiator. I read in a book that 420 was built in the last three months of 1955. How can I find out when it was in fact built Thanks for your help. i have a 1960 ford tractor 3000 and just changed the fuel filters, and cannot get fuel to them. HELP!!! I have several 425 hay cubers running. I have a John Deere 420H with power steering for sale.....open for offers. Have several of the old 420/430 Tractors. Enjoy restoring and using them. Always looking for a new project tractor to restore, Especially the standards, and tall high crop tractors. Feel free to call me at 330 416-4613 if you have a tractor youd like to sell. Thanks! 56 JD420 Nebraska Test, 28 HP. I own a 1956 JD 420-T. Would like to know horsepower for this 2 cy. engine. Also am looking for a hydroulic pump for same model. www.toytractortimes.com/tttsubscribe/workmay04.htm Scroll to the bottom of the page for pictures and even the front cover of the JD sales brochure. I have been around these quite a bit. I heard that JD only built 65 altogether. At one time, I knew where 17 of them were. my wifes uncle has an old 420 john deere that needs the transmission put back together my father-in-law thinks it is around 1960.can anyone help me with diagrams for this tractor.the person who took it apart has since passed on before he could put it back together again.he was replacing a gear in it. I have a JD model 820, serial 4048. It is a yellow track layer with "2010" decals, a 4 cyl diesel and 4-1 doitt loader, only a home made counter weight on the back. I will soon be offering it for sale in San Diego, any one interedted?? i am looking for a 1980 -1990 ford truck body just a shell i have new motor & transmission i just need a good body please help if you can. I am looking for a 420W in running order for restoration.Preferably in Great Lakes area.Please e/mail info and or photos if possible. I am looking for a 40-H 320-v 420-H 420-V 430-H 430-V Phone 804-6392701 at night or 804-6400864 day. I have a 420w row crop utility tractor and am trying to replace the rear oil seals in the three point hitch lift arms but am unable to get the arms to slide off the rock shaft.Do I need a bigger hammer or is there a secret? I HAVE A 420T,58 MODEL WITH SLANT STEERING AND OLD STYLE DASH.ITS GAS.I HAVEN'T RAN IT IN 4 OR 5 YRS BECAUSE THE CARB IS SHOT. I HAVE A NEW/REBUILT ONE BUT HAVEN'T PUT IT ON.WHEN I DID RUN IT THE MOTOR WAS STRONG WITH NO SMOKE AND THE LIFT WAS STOUT.THE BACK TIRES & TUBES ARE NEW(BUT THEY'RE TOO BIG 12-28's)THE FRONT HOLD AIR & THATS IT.THE SHEET METAL IS PRETTY GOOD.I HAVE 1400$ IN IT & 175.00 IN THE NEW CARB. IT'S IN DENISON,TX. My Dad bought one of these high clearance 420 John Deere in Cullman Co. Alabama back in the 60s. We used it for years and never had a mintues problem with it. My Dad sold it in the 70s to someone in North Al. but he doesn't remember who the person was. I would love to track it down. It had a sticker on it from the John Deere dealer in Cullman Al. I have no record of the serial number but would recognize it. My Dad had to weld a spot on the rear axle. Any help would be appreciated. I am also interested in purchasing a 420 and I would also like to know if the hydraulics and the PTO are live? So if anyone can help I would sure appreciate it. Thanks from Iowa. question i have a jd 420 tricycle and would like to know if it can be changed to a utility version by changing the front and puting in a wide front axel..
Love those 420's, I have a 1957 420W. Hope to retore it. 420 Gas engine had 27.1hp at draw bar and 29.2 at PTO. I am sure this was new, because mine tested out at 18hp. Mine also needs the timing adjusted. I have a 1956 all green 420 john deere for sale tractor is in good condition. $2800.00 firm. 580 889-6498 Atoka Okla. I'M LOOKING FOR A JOHN DEERE 420 TO RESTORE. the tractor pictured has strait steering wheel.1956 and 1957 had a strait wheel where the 1958 had a slant wheel. i hav a 1958 my dad bought new in the fall of 57. he passed away in 89 and willed it to me. i have restored it and take it to a lot of shows. i have got a lots of blue ribbons with it. the tractor can not,i repeat, can not be bought. thanks for your time. I have a 420U for sale, SN 103693 $2250. Border of NH and Me. I HAVE A 420T AND IT IS A NARROW FRONT IT IS THE BEST TRACTOR IN THE WORLD I WOLD NOT GIVE IT UP FOR NOTHING! To David Humphrey; I also own a 420. My lift quit working too. I would appreciate any info. you recieved from your inquiry. Thankj you. Can anyone give me an estimated value on a 1958 John Deere 420 row crop,original owner bought new in 58. Used daily,new tires,rebuilt engine,good condition. 420T John Deere; I own a working 420T which is the last purchase my father made before he died in 1976, so it is very special to me. The the 3pt lift has stopped working, though, so I could use some advice on troubleshooting it. I am not the greatest mechanic. Also, what is the correct paint for the 420 made in 1956? I am told there is more than one version of JD "green" Thanks, David. For Sale Johd Deere 420 W , Tractor is in Very Good Condition, Have owned it for three years , need room and cannot store any longer. Located in Huntsville , Oh. (northwest central Ohio. Ph. 937-686-6666. $4000.00. I have a john deere 420 w for sale , recent new paint ,runs good, has turf tires on rear. this tractor was used on a golf coarse. I OWN 420H RESTORED IT MY SELF. WOULD LIKE MORE INFO. I put in the wrong e-mail address. This is the correct one. Thank you very much. This is a great site! My father has a 420w John Deere, I believe it's a 1956 model. does anyone have org pictures, or restored pictures of this model tractor? Thanks. This is a Chinese company needing some tractors of 120HP(horse power) urgently.I read your models and pictures just now.But I don't understand what they mean.Such as model 80,model 420H? It's different from ours when describing a tractor. If I say model120,it mean the tractor is 120HP. So could you tell me what your models mean? Thank you. I would like to buy a 420. Anybody know of one for sale? I live in eastern Oklahoma so it would be nice if it would be found close to home. I have a 420S John Deere early model. I would like some information to restore it. It has been garaged kept since 1956.